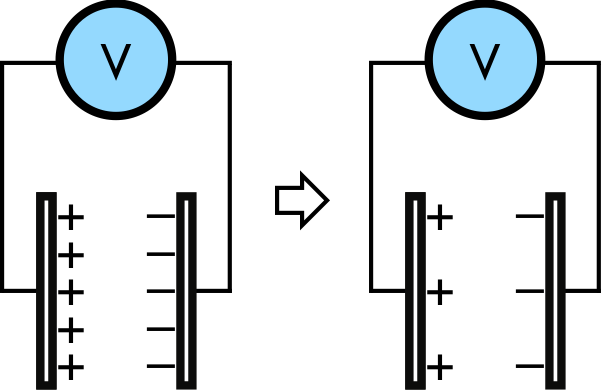 A capacitor is made from two parallel metal plates, and is charged with equal amounts of opposite charge. Both capacitor plates slowly lose their charge, due to being exposed to humid air. Discuss why the voltmeter reading attached to the capacitor decreases as this happens. Explain your reasoning by using the properties of capacitors, charge, electric potential, and energy. because capacitance remains constant, then charge and voltage difference are proportional to each other, and thus a decrease in charge results in a decrease in voltage difference. As (p), but argument indirectly, weakly, or only by definition supports the statement to be proven, or has minor inconsistencies or loopholes. Does not explicitly discuss (1). Nearly correct, but argument has conceptual errors, or is incomplete. Limited relevant discussion of supporting evidence of at least some merit, but in an inconsistent or unclear manner. Some garbled attempt at applying the properties of capacitors, charge, electric potential, and energy. Implementation/application of ideas, but credit given for effort rather than merit. No clear attempt at applying the properties of capacitors, charge, electric potential, and energy. A vertical wire has a decreasing amount of current flowing upwards. Circular metal loops (of resistance R) oriented flat along the north-south direction are held by four different observers. 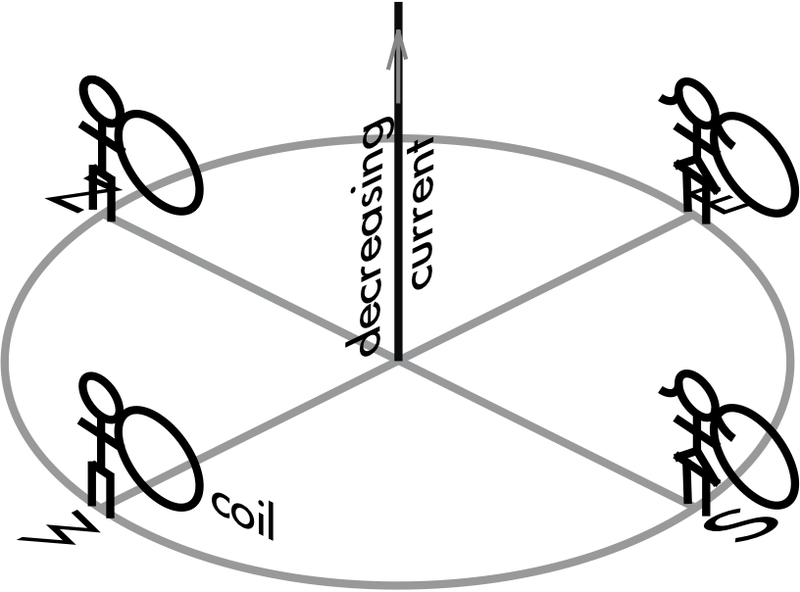 Determine which observer (if any) will have a coil with an induced counterclockwise current, as seen in this perspective. Explain your reasoning using the properties of magnetic fields, forces, motional emf, Faraday's law and Lenz's law. from Lenz's law (and right-hand rule 3), only the north observer will experience a counterclockwise induced current to counter the decreasing flux that points east-to-west through it (while the south observer will experience a clockwise induced current to counter the decreasing flux that points west-to-east through it). As (p), but argument indirectly, weakly, or only by definition supports the statement to be proven, or has minor inconsistencies or loopholes. Correctly discusses (1)-(2), but has problems with discussing (3): typically may not have explicitly discussed why the magnetic field of the induced current in the north observer's loop must point in the same direction as the (decreasing) magnetic field from the wire, or determines that the south observer's coil will have a counterclockwise induced current. Nearly correct, but argument has conceptual errors, or is incomplete. At least some attempt at using magnetic forces and/or magnetic flux. Correctly discusses (1)-(2), but discussion of (3) is incomplete or missing. Limited relevant discussion of supporting evidence of at least some merit, but in an inconsistent or unclear manner. Some garbled attempt at applying theproperties of magnetic fields, forces, motional emf, Faraday's law and Lenz's law. Implementation of ideas, but credit given for effort rather than merit. No clear attempt at applying the properties of magnetic fields, forces, motional emf, Faraday's law and Lenz's law. Unstable oxygen isotopes O(15,8) and O(19,8) can undergo some type of beta decay to become more stable[*]. Determine which one of these two isotopes (or both, or neither) will specifically undergo β+ decay. Explain your reasoning using the properties of nuclides and radioactive decay modes. O(19,8) (which has 11 neutrons and eight protons) undergoing β+ decay results in N(19,7), which is a less favorable ratio of 12 neutrons to seven protons), so β+ decay is not likely for this oxygen isotope. As (p), but argument indirectly, weakly, or only by definition supports the statement to be proven, or has minor inconsistencies or loopholes. May have only discussed why O(15,8) would undergo β+ decay, but does not discuss why O(19,8) would not. Nearly correct, but argument has conceptual errors, or is incomplete. At least understands β+ decay (and other weak interaction decays), but does not properly discuss how ratio of neutrons to protons affects stability. Limited relevant discussion of supporting evidence of at least some merit, but in an inconsistent or unclear manner. Some garbled attempt at applying properties of nuclides and radioactive decay modes. Implementation/application of ideas, but credit given for effort rather than merit. No clear attempt at applying properties of nuclides and radioactive decay modes. Physics final exam question: valid or invalid Feynman diagram? Discuss whether this Feynman diagram is valid or invalid. Explain your reasoning using the properties of Feynman diagrams, particles and antiparticles, and interactions. charge conservation is violated (zero charge of neutron does not equal the net positive charge of neutrino, positron, and proton out). As (p), but argument indirectly, weakly, or only by definition supports the statement to be proven, or has minor inconsistencies or loopholes. Nearly correct, but argument has conceptual errors, or is incomplete. 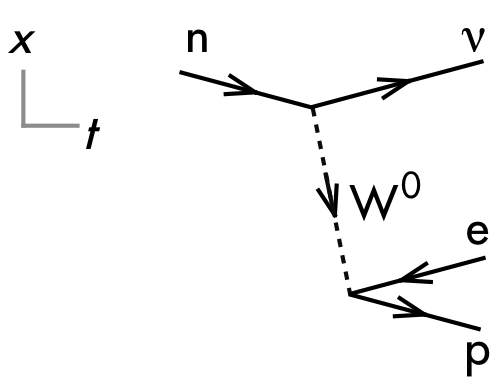 May argue why this Feynman diagram is invalid as does not correspond to a known weak decay process (but discussion of the known weak decay process is garbled); or argues that this Feynman diagram is valid as the "one line in, one line out" vertex rule is obeyed by both vertices (although charge conservation is violated, and the nucleon and lepton paths are mixed). Limited relevant discussion of supporting evidence of at least some merit, but in an inconsistent or unclear manner. Some garbled attempt at applying properties of Feynman diagrams, particles and antiparticles, and interactions. Implementation/application of ideas, but credit given for effort rather than merit. No clear attempt at applying properties of Feynman diagrams, particles and antiparticles, and interactions. A NASA education guide for high school students[*] details plans for a simple microscope using an f = +28 mm objective lens and an f = +46 mm eyepiece lens, separated by a lens-to-lens distance of 160 mm. Determine the distance (in mm) that an object should be placed at in front of the objective lens for viewing through this microscope. Show your work and explain your reasoning by using ray tracings and/or thin lens equations, properties of lenses, images, and magnification. knowing the focal point f1 = +28 mm and the image distance di1 = 114 mm for the objective lens, uses the thin lens equation to find the object distance do1 for the objective lens. Nearly correct, but includes minor math errors. Nearly correct, but approach has conceptual errors, and/or major/compounded math errors. At least recognizes the placement of the intermediate image produced by the objective lens between the objective lens and eyepiece lens. Implementation of right ideas, but in an inconsistent, incomplete, or unorganized manner. Garbled attempt at applying ray tracings and/or thin lens equations, properties of lenses, images, and magnification. Implementation of ideas, but credit given for effort rather than merit. 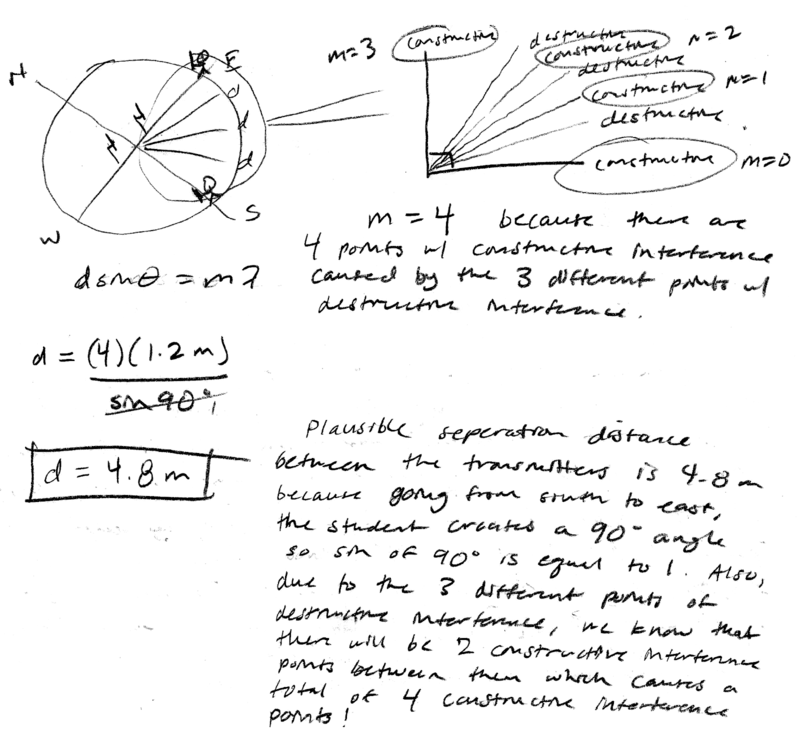 No clear attempt at applying ray tracings and/or thin lens equations, properties of lenses, images, and magnification. 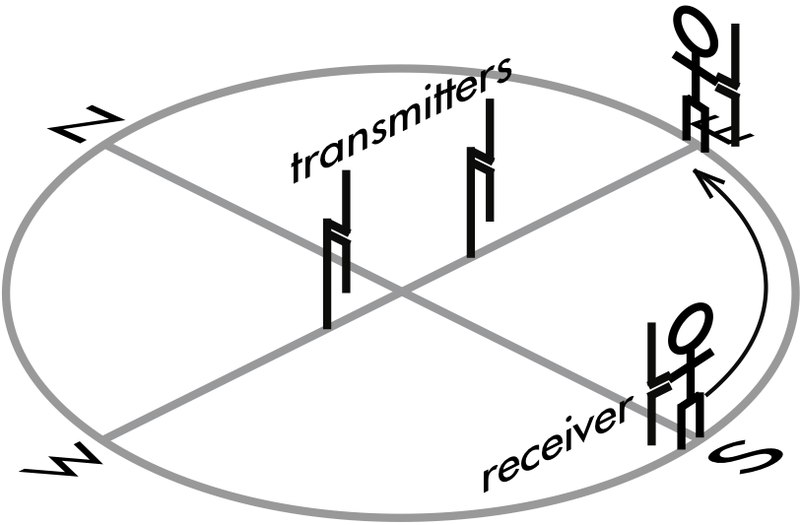 Two vertical radio transmitters broadcast in phase at the same wavelength of 1.2 m, and are spaced a certain apart along the east-west direction. 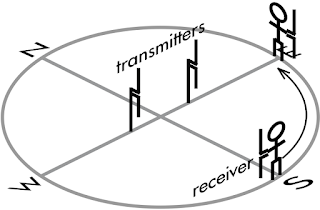 A Physics 205B student holding a receiver starts from due south of the transmitters, and detects three different locations with destructive interference signals before finally reaching due east of the transmitters. 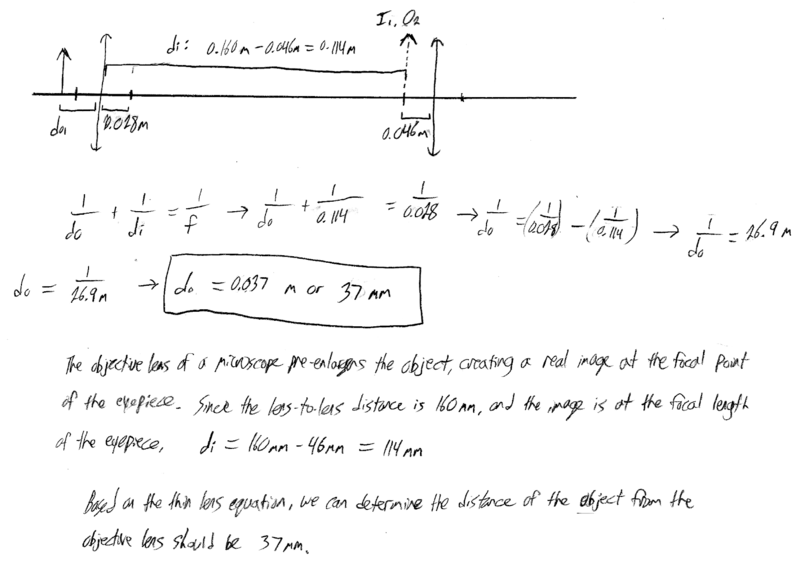 Determine a plausible separation distance (in m) between the transmitters. Explain your reasoning using the properties of source phases, path lengths, and interference. using the constructive interference condition d⋅sinθ = m⋅λ, where m = 0, 1, 2, ..., finds the separation distance d such that the third maxima (m = 3) will be at θ = 90°; which allows for the m = 0, 1, and 2 minima to exist within that range (i.e., d = 3.6 m). Nearly correct, but includes minor math errors. May have claimed equally spaced minima angles at θ = 30°, 60° and 90° to find a plausible separation distance d using θ = 30° for the first minima angle. Nearly correct, but approach has conceptual errors, and/or major/compounded math errors. Implementation of right ideas, but in an inconsistent, incomplete, or unorganized manner. Garbled attempt at applying properties of source phases, path lengths, and interference. Implementation of ideas, but credit given for effort rather than merit. No clear attempt at applying properties of source phases, path lengths, and interference. 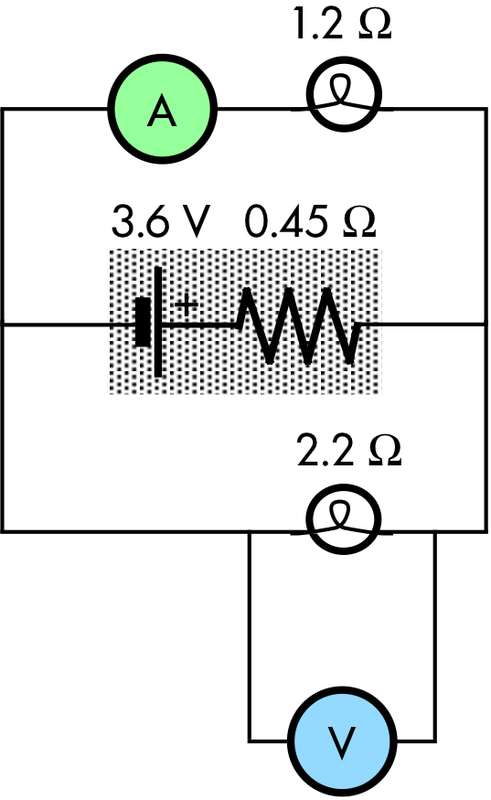 A lithium battery with an emf of 3.6 V and an internal resistance of r = 0.45 Ω is connected to two light bulbs (each with different resistances), an ammeter, and a voltmeter. Determine (a) the ammeter reading (in amps) and (b) the voltmeter reading (in volts). Show your work and explain your reasoning using the properties of voltmeters, Kirchhoff's rules and Ohm's law. 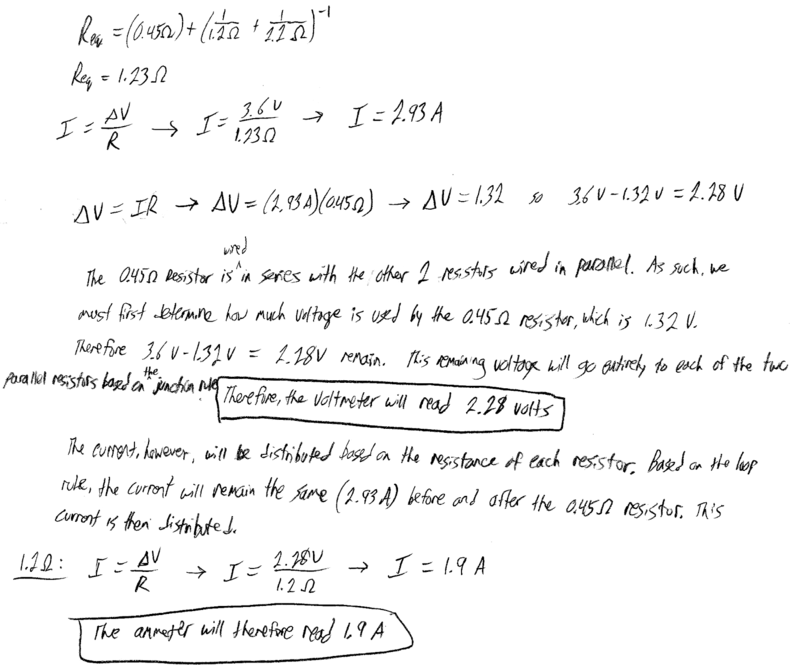 knowing the voltage rise of the emf and the voltage drop across the 0.45 Ω resistor, uses Kirchoff's loop rule to determine the voltage drop across the 2.2 Ω resistor, which is the voltmeter reading. Nearly correct, but includes minor math errors. Has determined at least one of (1)-(2), but only one of (3)-(4) is complete/correct. Nearly correct, but approach has conceptual errors, and/or major/compounded math errors. At least only one of (1)-(2) is complete/correct. Implementation of right ideas, but in an inconsistent, incomplete, or unorganized manner. Garbled attempt at applying Kirchhoff's rules, Ohm's law, and properties of ammeters. Implementation of ideas, but credit given for effort rather than merit. No clear attempt at applying Kirchhoff's rules, Ohm's law, and properties of ammeters.